Put 1 and 1 on your starting board in the highest-numbered Jungle. A slowly growing wall - expanding can sometimes be difficult, but the Invaders will have an equally difficult time penetrating wherever the Keeper plants itself. In larger games, it may be useful to spread to one of the two far-distant lands early on, to have multiple points from which to slowly grow. Any time you create a , push all from that land. Dahan Events never move to your , but Powers can do so. 2 2 3 +1 Damage per you have. 4 Split this power's Damage however desired between target land and another 1 of your lands. 2 Push 1 from target land per 2 you have. 1 If target land has no , add 1 . Target Spirit gains a Power Card. IF you target another Spirit, they also gain 1 Energy. If there are 2 or fewer in target land, remove 1 . 2 Damage per in target land. OR Add 1 . 2 Damage per your in or adjacent to target land. Destroy all . Growth: Like Sharp Fangs, Keeper of the Forbidden Wilds can mix-and-match with two different Growth choices. Keeper has two ways to add Presence, but one of them costs 3 Energy to make use of, and both are restricted: it grows most readily where there are Wilds or its own Presence, but in a pinch can expand anywhere there isn't Blight. Special Rule - Forbidden Ground: The Dahan will evacuate anyplace where Keeper sets up a Sacred Site, and not return unless a Spirit explicitly gives them the OK to do so. This can be inconvenient, as it deprives Keeper of some forms of Dahan assistance, but also lets it get the Dahan out of the way of some of its Powers - which will be important, as we'll see in a moment. Innate Power - Punish Those Who Trespass: Here we go: at base, this destroys a Town, but also a Dahan. With more wrath (Fire), Keeper brings extra damage commensurate to its core elements (Plant + Sun), wiping out Cities and more. Innate Power - Spreading Wilds: We'd expect to see some easy way for Keeper to add Wilds, given that it relies on them to spread. 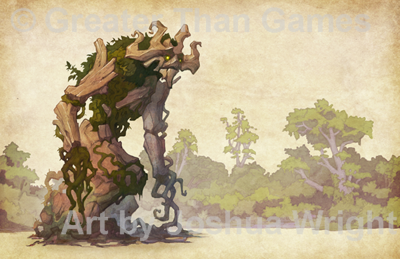 Spreading Wilds can't affect lands with Blight, so we see that Keeper has a hard time spreading to blighted lands - as one might expect, for a guardian of untainted wild places. How about its Unique Powers? It's very strong in Sun and (especially) Plant. But it only has one Fire, so the higher level of Punish Those Who Trespass will require drafting more Fire, and has no Air, so the Air-based Range boost to Spreading Wilds isn't an option at first. Everything costs 1 Energy or more. Fortunately, Keeper has the Energy income to support that. Towering Wrath is a hammer that starts medium-sized and gets bigger the more Sacred Sites Keeper has in an area. It's also Keeper's only +Fire to start with, so Towering Wrath will pair with Punish Those Who Trespass - Keeper's going to have some big stompy turns when it gets mad. Towering Wrath wipes out Dahan, though, so needs to be used carefully to avoid friendly fire casualties. ...but Regrow From Roots offers Blight removal! Only in Jungle and Wetlands, the areas of densest vegetation, but still way better than nothing, particularly since Keeper depends on Blight-free lands for Wilds and expansion. Finally, Boon of Growing Power lets a Spirit draw upon the power of the ancients that Keeper serves, gaining Energy and a Power Card. Keeper has fairly plentiful access to both of these things (as it already serves those ancients), so it will likely use this on other Spirits more often than itself. Overall: Keeper of the Forbidden Wilds is very mobility-limited at first, as it has a hard time adding Wilds at further than Range 1. However, it's exceptionally good at defending its turf: Wilds prevents Exploring, and its damaging powers can hammer those Invaders that sneak past (or are Pushed in). Keeper's choices about where to plant itself very much shape the strategic flow of the game: will it stake out its home board, form a wall to isolate one part of the island, occupy the center, or split into two main enclaves for more versatility? Later on, it can spread more readily (as it becomes able to range-boost Spreading Wilds), and if given the time to reach the higher reaches of its Energy track can shower down multiple Major Powers per turn without missing a beat. This page was last edited on 5 October 2017, at 18:53.